Gordon Brown was a past-master at sneaking in new taxes by stealth, but his efforts as Chancellor and then Prime Minister were merely the latest in a long line of party leaders desperate to extract more money from reluctant taxpayers. This book challenges the need for government to resort to such underhand practices which undermine the economy, killing the goose which lays the golden eggs, and the integrity of the political process. 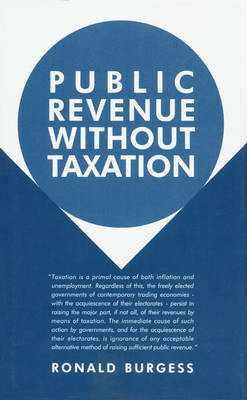 The author argues that not only does taxation flout the principle of private property, but it 'is a primal cause of both inflation and unemployment. Regardless of this, the freely elected governments of contemporary trading economies - with the acquiescence of their electorates - persist in raising the major part, if not all, of their revenues by means of taxation. The immediate cause of such action by governments...is ignorance of any acceptable alternative method of raising sufficient public revenue.' Burgess shows how the development of Keynes' general theory of employment 'leads to the conclusion that an open trading economy is likely to be most competitive, and therefore most prosperous, only when taxation is abolished' - but government must be funded. How can this be done without taxation? To provide an answer he refines Alfred Marshall's distinction between the public and private value of property to reveal an alternative, peculiarly public source of revenue. Unlike a tax, defined by a former Labour Chancellor, Hugh Dalton, as 'a compulsory contribution imposed by a public authority, irrespective of the exact amount of service rendered to the taxpayer in return', the 'public value' identified by Marshall would deliver an exact equivalence between the benefits enjoyed and the amount paid. On the basis of this widely accepted definition, therefore, it is not a tax but the price for services rendered like any other transaction - the price fixed by the market. The author shows how reform may be introduced with a minimum of disruption, so that politicians with an eye to re-election can achieve measurable results during the lifetime of a parliament.